Brussels will stay on the highest level of terror alert because of the "serious and imminent" threat of Paris-style attacks, Belgium's prime minister says. Charles Michel added that universities, schools and the metro would stay shut. Brussels has been on lockdown all weekend, amid a manhunt for suspected Paris attacker Salah Abdeslam. Meanwhile, the BBC understands that a suicide bomber - pictured in a new French police appeal - arrived in Greece under the name of M al-Mahmod. The BBC's Ed Thomas has matched the image released by French police with a photo on the arrival papers of a man who reached the Greek island of Leros on 3 October. The man was with a group of Syrian refugees and with another attacker who was travelling under the name of Ahmad al-Mohammed. French police have asked for more information about the man, whom they say was the third suicide bomber to strike the Stade de France on 13 November. Islamic State militants, some of them from Brussels, killed 130 people in Paris on 13 November. Earlier on Sunday, the Belgian prime minister told reporters in Brussels that the authorities fear "an attack similar to the one in Paris, with several individuals who could also possibly launch several attacks at the same time in multiple locations". Media captionPrime Minister Charles Michel: "There is a sustained, serious and imminent threat against the capital"
Earlier, Belgian Interior Minister Jan Jambon said the danger to Belgium was not tied to Abdeslam alone. 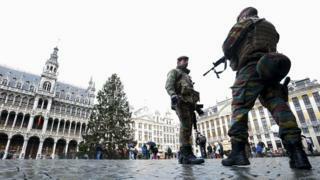 "The threat is broader than the one suspected terrorist," he told Flemish broadcaster VRT. It was not clear if Mr Jambon was referring to those involved in the Paris attacks, or others who might be planning attacks in Belgium. Media captionMohammed Abdeslam, speaking to RTBF: "We want Salah to surrender"
The Belgian authorities have so far charged three people with involvement in the Paris attacks, claimed by Islamic State militants. French media have reported that nine militants carried out the attacks, and seven died on Friday night. One of the men who drove Salah Abdeslam to Belgium told his lawyer that he was dressed in a "big jacket" and may have had a suicide belt. Friends of Abdeslam told ABC News they had spoken to him on Skype and said he was hiding in Brussels and desperately trying to get to Syria. They said he was caught between European authorities hunting him and IS members who were "watching him" and were unhappy that he had not detonated his suicide belt. Meanwhile on Saturday, members of the US rock band Eagles of Death Metal described the horror of the Bataclan concert hall massacre in their first interview since the attack. Lead singer Jesse Hughes said a group of fans who hid in the band's dressing room were found by the gunmen and killed except for one who hid under Hughes's leather jacket. In a clip from the interview with Vice News to be released in full next week, an emotional Hughes said: "A great reason why so many were killed was because so many people wouldn't leave their friends. So many people put themselves in front of people." Are you in Brussels? How have you been affected by the raised terror alert level in the capital? Email your experiences to haveyoursay@bbc.co.uk.